In the battle of the old school technique (pen and paper) vs. modern day technology (spreadsheets and power point) who is more likely to win? Is the paper mightier than the server? 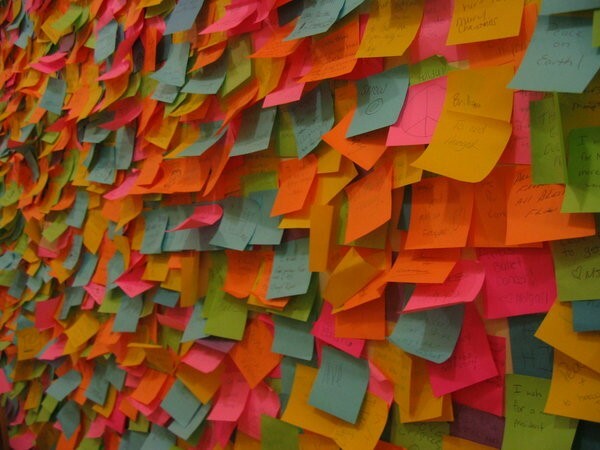 Will the spreadsheet fall to the sticking power of a post-it note? I can remember being in school and having to write out long equations for math problems. My question (or grumble) was, why we couldn’t just use the calculator. The response was always the same, because you need to learn how the math works. I have come to understand that answer more as I have progressed in my career (not a career in math). Being able to work it out on paper helps you see the solution and understand how you got there. #1- it’s visual and most people are visual learners. According to Pearson Education, 65% of us are Visual learners (as opposed to auditory learners). Visual learners are most effective when they are seeing things such as diagrams, flowcharts, or graphs. They will remember information they saw rather than what they heard. Visual learners struggle with verbal instructions and may tune out during a lecture. Using low tech tools like drawing on a white board helps the visual learners to absorb information by creating an image. #2 – it’s tactical and that promotes engagement. Have you ever been in a meeting and pulled out your laptop to project on the screen? How many people did you lose either in the process of getting connected or within minutes of starting? If you have never observed this in action take a look around the next time you or another facilitator attempts this technique. I think you will be surprised at what you observe. Need to understand a process? Have the subject matter expert draw out the process flow on a white board. Have others provide input using different colors. Encourage the team to gather around the board for quicker collaboration. Gathering requirements? Have a stack of index cards on the table (enough for all participants). Have the team write their requirements on a card and read them out loud to the team. The requirements can also be taped to the wall for prioritization, sequencing, or other grouping. I have had such success with this technique that it is now my preferred method for gathering requirements. Conducting a risk planning workshop? Have colored dots (red, yellow, and green) on hand for team members to prioritize the risks. Have team members place the colored dots on the risks they feel are high, medium, and low. This helps the team quickly see the areas that need additional discussion or focus. #3 – it’s just fun! We have already discussed how most people are visual learners and that engagement improves success. Really, it’s just more fun to be low-tech. Yes, I know that seems kind of crazy. After all, we aren’t paid to have fun at work. Well, that is wrong, more and more companies are adopting new strategies to solving problems and that includes low-tech approaches like game theory. Check out innovationgames.com for more fun tips. I love this site and have used a number of the games in various brainstorming sessions. To all my superhero PMs out there, I hope we learn this lesson… spreadsheets are boring and teams want to interact! So, pick up your sticky notes and go fight the villains of boredom and disengagement that threaten our projects. An engaged team will have more fun and that can drive results!